The pen-and-ink creatures that inhabit comic strips and cartoons are usually grotesque caricatures of genus homo or more restrained sketches representing no one in particular. But people who live and breathe, or rather, their likenesses imprisoned in ink and crayon, perform on the back page of the New York World each morning in Denys Wortman's "Metropolitan Movies." Rotund matrons, leggy flappers, wide-trousered shipping clerks and tired old men and women with the stamp of tragedy on their faces act out in this cartoon the comedy and hardness of daily life in Manhattan's wilderness of steel and stone. Each character in "Metropolitan Movies" has his or her counterpart somewhere in the five boroughs Of New York; and the streets and buildings which fill its stage are recognizable to most readers familiar with the city. Wortman sketches them as he walks or rides about town in the course of his daily activities. It would be impossible for him to work any other way, he told the writer, because the actual drawing of the cartoon is more important to him than the caption which it is to illustrate. He is intensely interested in the technique of making pictures and, consequently, works much detail into his cartoons. His method of using ink and crayon, he thinks, makes it possible to obtain such complete reproductions of persons and objects. His completed drawings give almost the effect of half-tones. "Drawing for newspaper reproduction in the style I use, with so much detail and grades of shading, presents quite a problem," Wortman said. "Combinations of heavy shadows and fine lines are so liable to smudge in newspaper work. But by making the dark spot support the more delicate lines, I think I obtain a result which insures clean reproduction." Wortman makes rough 'note' sketches of anybody or anything that strikes his fancy in his daily peregrinations about the city. The subway, he claims, is a gratifyingly fruitful source for human types. In sketching persons in the underground trains, he tries to cover his activity as much as possible behind a newspaper so his subject will not take notice and become embarrassed. "Not only am I afraid the person I'm sketching will be embarrassed," the artist confided, "but I become terrifically embarrassed myself, if I'm caught by my subject. I get very fidgety when I work that way." Sketching objects presents its difficulties, too, Wortman said. "Department stores are particularly difficult places in which to make 'notes.' If the floor managers see you, they always request that your stop. I don't blame them either. They don't know what you're up to. Their competitors often send artists to sketch their styles, and they have to be very careful." Despite the difficulties he meets, Wortman insists on actual models for his cartoons. He often uses photographs from which to copy buildings or even complete street scenes. In drawing buildings or other structures, though, he departs from his rule of including great detail because he thinks it would complicate the drawing too much for good reproduction. He draws as much as possible of the structure true to form, however, and never invents objects, such as lamp posts, hydrants, houses, wagons or any of the familiar trappings of metropolitan life. "It's very easy to overlook many small characteristics of familiar things," he explained, "and, consequently, you're liable to draw something that will not be a good representation of what it's supposed to be. There are specialists for every little item you draw, and if you're going in for detail, they're almost certain to pick you up on errors. "People are, somehow, very peculiar about picking faults in seemingly unimportant matters. For instance, I drew a picture for 'Metropolitan Movies,' not long ago, of three musicians riding home in the subway after a dance. I had made 'notes' of the actual musicians in the drawing about one or two o'clock in the morning. I had also included the background of the subway car in the sketch. Nevertheless I received a note from a reader telling me the sign in the car window, showing the destination of the train, was wrong. He said express trains didn't go to the station named on the sign. "But that time the reader was wrong, for I had made the sketch after one a.m. when no expresses were running, and the sign in the drawing was an exact copy of that in the local on which I had ridden." Another incident which shows how closely cartoons are sometimes scrutinized arose out of a Memorial Day drawing Wortman made. It showed a soldier's grave with a mother standing by it. On the headstone, the artist had lettered the name of a boy he knew who had given his life in the World War. After the cartoon appeared Wortman received several letters from persons related to the boy either directly or indirectly. Some of the letters came from middle western cities. Although the surface of New York life glitters with a thin frosting of comedy, there is a thick layer of heartache underneath, some of which comes to the surface in an occasional poignant drawing of Wortman's. For, like O. Henry, sometimes he deviates from the highway of merriment into the byways of the "seamy side" which most people try to avoid. And he finds that these serious efforts create greater response among readers than his more humorous creations. "The 'tear jerkers,' as they are called, always draw the most comment," he said. "They seem to appeal to the average person more strongly than comedy." A particularly appealing picture of life in the crowded districts of the metropolis was drawn by Wortman several months ago. It showed a mother and two children in a dingy, poverty-stricken room in an attitude of apprehensive listening. The mother was looking significantly at the children. She was saying, "I hear him coming up the stairs slowly, so don't ask him if he got a job." Wortman possesses an understanding of human nature and its many-sided characters more readily associated with authors and philosophers than with cartoonists. It shows itself in his pictures of the less opulent middle class life. One of these drawings shows an old man and his wife sitting by the window of their tiny flat, presumably watching their daughter on the street below with her beau. One of them says, "He's a real sport, alright. He's taking her in a taxi." Wortman thinks the contrast between the laughable and the realistic helps to keep his cartoons interesting. "If I drew all sob stuff," he said, "the public would soon get tired of it, and if I kept up the comedy continuously they would merely take it as a matter of course." Wortman is primarily an artist, having studied at the Chase School in New York under Kenneth Hays Miller, to whom he says he owes much for his aid in art studies. The Chase is now defunct, but during its period of existence it sired some of the country's best known artists, among them George Bellows, Rockwell Kent, Edward Hopper and Guy Debois, all of whom attended the school at the same time as Wortman. Before attending art school Wortman had studied at Rutgers University and Stevens Institute of Technology and was well on the road to becoming an engineer when he decided he would rather paint and set aside his compass and plumb line to take up the brush and palette. He still retains a keen liking for mathematics, though, and is greatly interested in new engineering developments. Taking up painting seriously, Wortman devoted all his time to it and about 10 years ago had produced enough paintings to hold a one-man show at the Daniel Galleries in New York. Later he had exhibits in showings at the Montross and MacBeth Galleries. He has not shown any of his work recently, but dominating one wall of his high-ceiling studio in Greenwich Village, is a large painting which, when completed, he thinks he might enter into an exhibition. In his spare time he paints portraits or decorates furniture in vivid colors. Until he was 30 years old, Wortman had never done any commercial art work. His first work in this line was illustrating magazine stories, but after several years he became dissatisfied with this occupation and turned to newspaper work. His first newspaper job was on the old New York Tribune about seven years ago. He remained there for nine months and then went back to free-lancing until he finally joined the World to take over the "Metropolitan Movies" assignment, after Gene Carr, the former creator of the cartoon, resigned. He has been with the World for about five years. This is really great. Thanks for posting, Allan. For those who have yet heard, Drawn and Quarterly is publishing a book about Denys Wortman. The New York Times does a nice write-up of the Wortman Show. And if you surf the Denys Wortman site at http://dwortman.com/ you'll find some Christmas cards to and from The Wortmans. Very appropriate for this time of year. Hope you're all having a good Thanksgiving. Me, I've got a rotten cold so bah humbug (or whatever the equivalent saying is for this holiday). 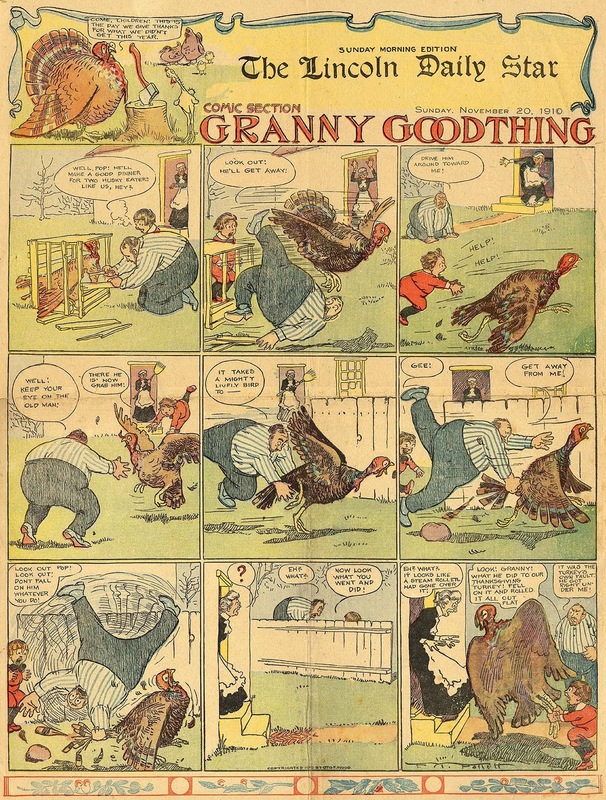 Cole Johnson, who actually thinks ahead to prepare for holiday posts, unlike me, sends this cornucopia of Granny Goodthing episodes, headlined with a funny Thanksgiving slapstick. 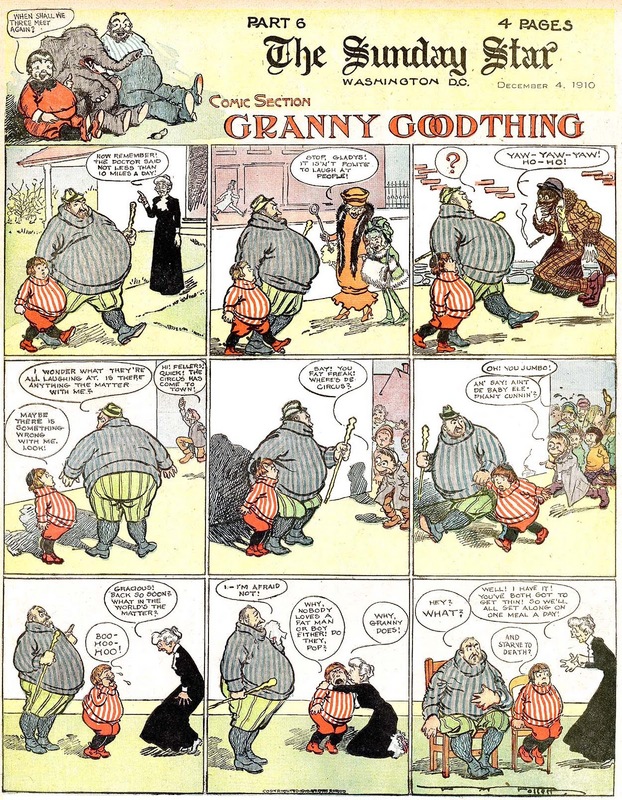 Granny Goodthing was the brainchild of one of my favorite turn of the century cartoonists, Foster M. Follett. Follett arguably did his best work for the New York World, but he made the rounds like most of the better cartoonists of the day. 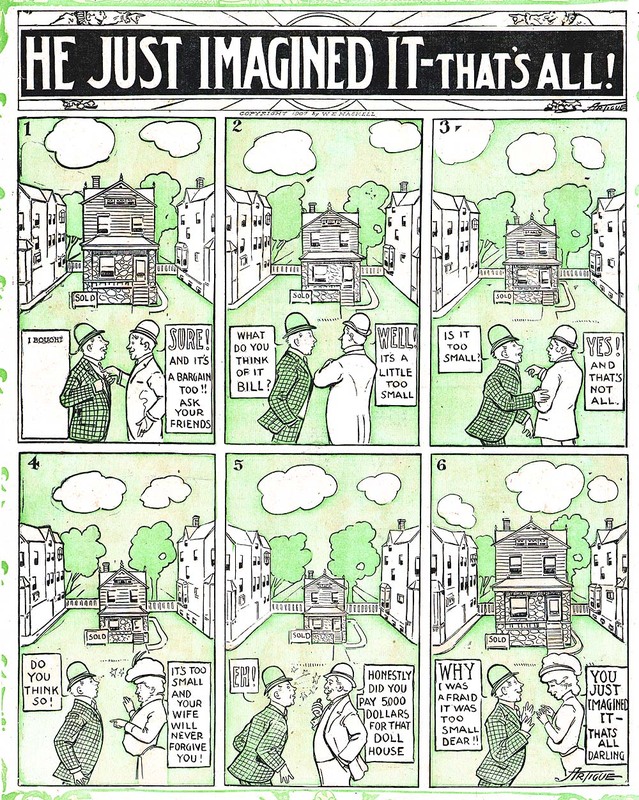 Granny Goodthing he did for the Otis F. Wood-copyrighted version of the McClure Syndicate Sunday section. The series ran from November 14 1909 to May 14 1911, a nice long run for a delightful strip. The premise was that a fat dad and his fat kid are treated rather shabbily by the cold cruel world and only darling granny ever gives them succor. Ah, the piteous plight of the porcine. Well, tough, says I. At least they weren't stuck sipping chicken soup and using up veritable forests of Puffs Plus on Turkey Day. Happy T-Day to the Stripper! These abscurities are like a Thanksgiving feast every day. 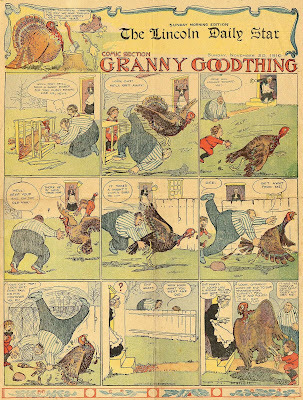 Hello, Allan and all---The original storyline of GRANNY GOODTHING was how her little grandson could get her to buy or do anything his little heart desired, no matter hofoolish it was. In 1910 parlance, she was a "Good Thing",that is, an easy mark. This didn't last too long, and the bizarre new plot had the little boy and his father now balloon up to pachyderm aspect, and their troubles with their terrible tonnage. Just right for the Thanksgiving entry!----CJ. ---Ad I hope you're feeling better, Allan!----C.J. Lambiek Comiclopedia has an excellent biography on Foster Morse Follett that was written, I believe, by a grandson, Douglas Follett. The one detail I question is the birth year which is given as 1878. The census records and a passport application clearly show that Follett was born in 1870. On the 1870 U.S. Federal Census Follett was two months old and the first child of Foster Valentine and Portia. The family lived in Sandusky, Ohio. In 1880 the Follett family included another son and a daughter. Some time later Follet's father died; his mother remarried but the date is not known. a cartoonist on the New York World. In 1910 the Follett family, with two more children, lived in Montclair, New Jersey. Follett's occupation was "Artist". In 1920 they lived at the same address, and he was an "Artist" at a "Studio". Follett passed away in 1938. 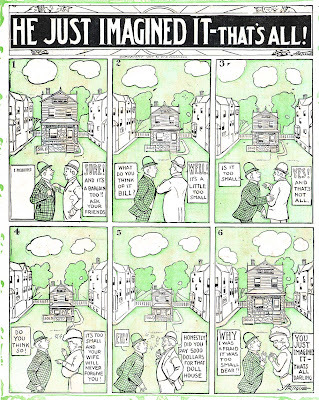 This fantasy strip by a fellow who went by the name Artigue is a pretty fair imitator to Winsor McCay's Dream of the Rarebit Fiend series. 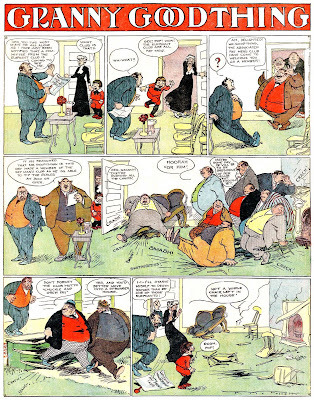 Unlike McCay's series, though, Artigue doesn't use the conceit of an upset stomach to get the fun started, he just lets his characters' minds run away with them. He Just Imagined It - That's All ran in the Boston Herald for just a few months, from December 30 1906 to March 10 1907, but continued in the W.E. Haskell-syndicated version of the Herald's Sunday section until the end of the line for the whole shebang on August 30 1908. I guess the Herald felt a little self-conscious about having a poor man's McCay running in their own paper, but figured it was fine for out in the sticks. We've met Artigue on one other occasion way back in 2006, with Chris and Christena's Courtship. I REALLY REALLY like this strip A LOT! The artwork is very good and the dialogue is tight, without any extra verbiage. Pierre M. Artigue was born in New Siberia, Louisiana on May 5, 1872 according to Edan Hughes' book, "Artists in California, 1786-1940". In the 1880 U.S. Federal Census, Artigue was the first of three sons born to Louis and Leontine. Born in France, their father was a carpenter; their mother was born in Louisiana. In the 1900 census the family plus a daughter lived in San Diego, California. Artigue's occupation was "artist - designing". His bothers were sign painters. Artigue was also boarding in Los Angeles; his occupation was "designer". When his cartooning career began is not known but he worked for the Los Angeles newspaper, Evening Express. 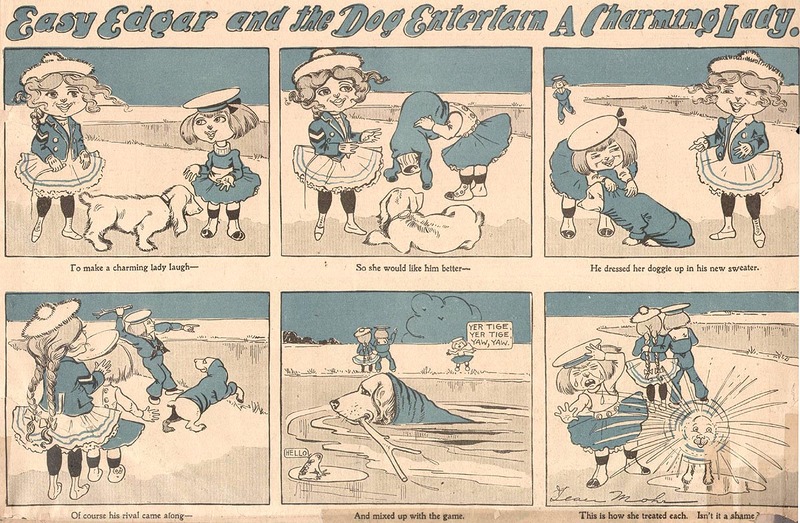 The May 1901 issue of Inland and American Printer and Lithographer reprinted his cartoon, "Events of the Week", for the month of February that included Valentine's Day, Washington and Lincoln's birthdays, and Chinese New Year. of the more pretentious exhibits of the show. Artigue returned to Los Angeles in 1914 according to "Artists in California, 1786-1940". In 1920 he was working as an "artist" in the "painting" industry. Artigue had an inventive mind and was aware of the motion picture industry. On February 23, 1926 the Reno Evening Gazette published an Associated Press report on Artigue's lawsuit against the motion picture industry. want of prosecution Feb. 25, 1929. Presumably all of Artigue's suits were dismissed in court. In 1930 Artigue was 58 years old and worked as a "cartoonist" for a "newspaper". His wife passed away in April 1933. He died on November 5, 1934 in Los Angeles. Political Cartoonists Now "Warming Up"
With the approaching conventions of the two leading political parties of the United States not far distant, those well known symbolic beasts, the elephant and the donkey, are being groomed to do battle on the editorial pages of partisan newspapers. Having served faithfully since the day long past, when they were created by Tom Nast, these political beasts are still used to a great extent by editorial cartoonists as a weapon of ridicule. Rollin Kirby, editorial cartoonist of the New York World and winner of the 1921 and 1924 Pulitzer prizes for cartoons, thinks the animals and all other symbols of editorial page cartooning are vitally necessary in conveying the idea of the cartoon to the public. "The public recognize the old symbols that have been used in editorial page cartoons for years. The symbols make it easier for them to understand the cartoon. I don't like to vary from the standardized symbols. See that bomb?" he pointed to the cartoon he had just finished, showing a huge, round bomb exploding, "That's the ancient, accepted form of a cartoon bomb. No one has thrown a bomb like that at anyone in years, but the public recognize it more quickly than they would a drawing of the new lead pipe bomb." 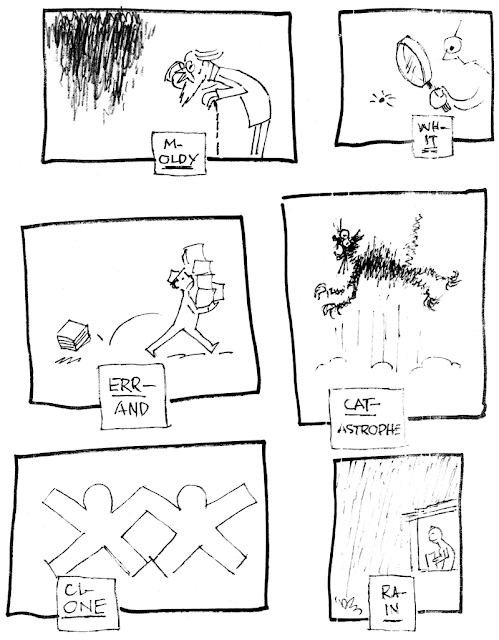 Mr. Kirby has been drawing editorial cartoons for 20 years, 15 of them on the World. The other five years were divided between the New York Mail and the Evening Sun. He doesn't think there's anything magic about drawing cartoons. "It's just a regular job," he confessed, "It's the same as being a doctor or a hydraulic engineer, I don't want to seem upstage, but there really isn't anything different about cartooning. It's merely a good manufacturing job." He thinks the editorial writer has more leeway than the cartoonist. "The editorial writer," he claims, "can do much more with words than we can do with lines and symbols." 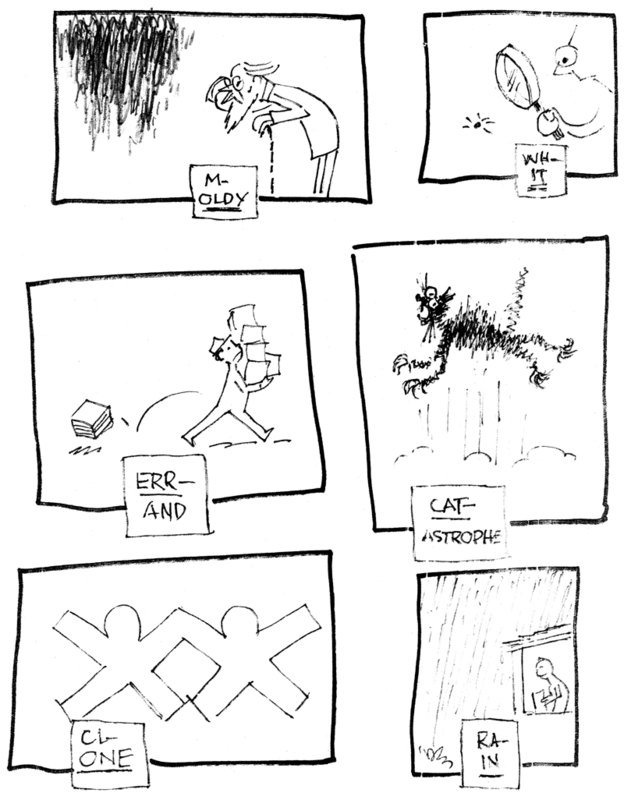 An extremely opposite view of editorial cartooning is held by John Cassel, who draws for McClure Syndicate, although he questions the effect of political cartoons in influencing voters. "The effect of the political cartoons is more to strengthen the attitude of a person toward his own party," Mr. Cassel says, "I don't think it would cause a man to change his party affiliations, unless that man already had a great incentive to do so." Mr. Cassels's method of working differs from most other cartoonists in that he does not depend very much on the usual symbols. He tries to tie his cartoon to some event of everyday life familiar to the great majority of people. Explaining his working methods, he says, "I skim through the news for an idea, I rarely go through the news thoroughly at first. Fussing around with it confuses me. The first flash of an idea gives me something to start on. Then I try to find a situation of human interest upon which I can build the idea. I try to avoid using symbols whenever possible. After I finish the cartoon I settle down and read the papers through." connection with the paper in the event that Smith should become a candidate for the Democratic nomination. When Governor Smith's hat went in the ring, Mr. Cassel's convictions were respected and the contract was terminated. Commenting on his connection with the World, Mr. Cassel said, "I always got along exceptionally well with the editors of the World. They allowed me to work in my own way, and never interfered with me. For 12 years our views were in common, and when they ceased to be in common I didn't want the job any longer. Sometimes I'm surprised that I lasted 12 years with my strong political convictions." Now that he is with a syndicate, Mr. Cassel says he is not called upon so much to draw partisan cartoons, his work must be more generalized. "I have to handle politics from a news angle, now, when I touch on them at all. Most of my editorial page cartoons now are on general news subjects." 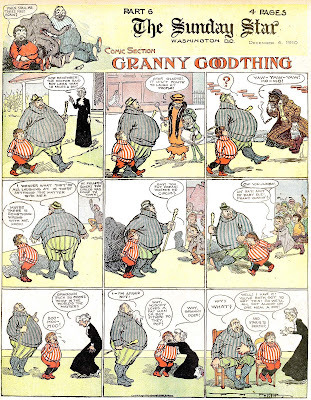 Discussing the influence of present day political cartoons with those of Thomas Nast, Mr, Cassel said, "The influence of Tom Nast's cartoons on the public was undoubtedly greater than that of modern cartoons. The political cartoon was new at that time, and people took more interest in it." During the photo-engravers strike in 1921 newspapers were left without any means of reproducing photographs or cartoons. 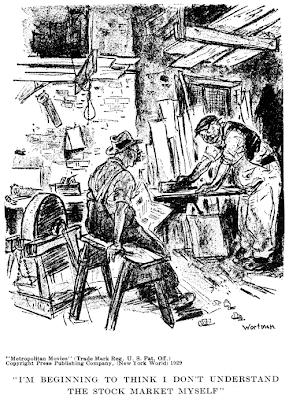 It looked as though the Evening World would have to go without a cartoon on its editorial page, until Mr. Cassel conceived the idea of constructing a cartoon from the odds and ends of the type racks. He laid aside his crayon and drawing board and stood in the composing room showing a compositor what symbols to use in making the cartoon. 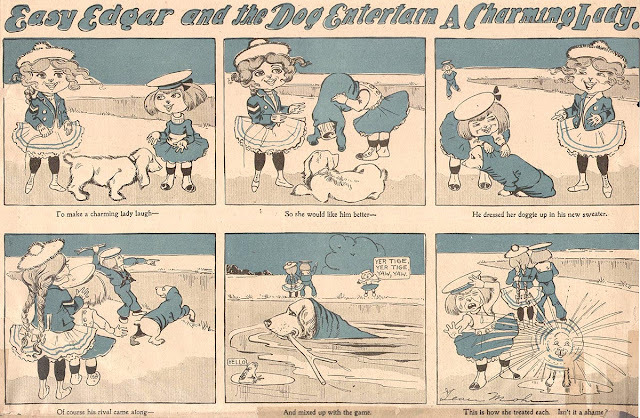 He was not allowed to touch the type himself, but the compositors co-operated with him enthusiastically, and in this way he made five cartoons. The cartoons that enliven the editorial page of the Brooklyn Daily Eagle are drawn by Nelson Harding, winner of the 1927 Pulitzer Prize, as well as that for 1926. In his studio on top of the Eagle building he surveys a vast expanse of Brooklyn's downtown business section and strives to draw cartoons from the woman's point of view. "Political cartoons are drawn too much from the man's point of view," he claims. "Women have the vote now and we should try to make our cartoons interesting to them. I doubt whether they fully understand the cartoons symbols, the elephant , the donkey and the Tammany tiger. If they are interested in politics, they probably get the significance of the cartoons, but if politics don't mean anything to them I don't suppose they pay much attention to them." Mr. Harding finds the symbols very useful in ridiculing the opposing party, if one works for a partisan paper. "A cartoon is a great offensive weapon," he told his interviewer. "If you want to direct some good-natured satire against the opposing political party, the animal symbols come in handy. For instance, in satirizing the Republican party I draw a picture of an elephant in trouble. A worried elephant always appears amusing in a picture." Mr. Harding thinks that even partisan political cartoons should never be used in a way that might give offense to anyone. In spite of his feelings on the subject, he says that cartoons are bound to irritate someone if they are even slightly partisan. He often receives letters from individuals and organizations complaining about certain cartoons he has drawn, though they are in strict accord with the policy of the Eagle and are not meant to offend anybody in the least. About 50 per cent of the value of an editorial page cartoon hangs on the caption, Mr. Harding believes. "A one-word caption is ideal," he holds. "The picture should be able to tell the story itself, but the caption should strengthen it so that there isn't any doubt about its getting across. Familiar titles of books or plays are valuable for use in captions. I build most of my cartoons on a caption." In the use of symbols, particularly in originating symbols for one's own work, Mr. Harding thinks that the symbol should be closely associated to the subject it represents. "If I were drawing a cartoon about a tariff cut," he explained, "I should naturally use a cutting implement of some sort as a symbol." He is also numbered among those who think that an editorial page cartoon is most effective when it is directed in favor of some campaign with a general appeal. The series of cartoons he drew for the Eagle's campaign against ambulance chasing in Brooklyn were very successful, he believes. He has been cartooning for the Eagle for 20 years with, as he says, "no time off for good behavior." In addition to his daily cartoon he writes a few sticks of editorial comment which appear on the front page of the Eagle every day. 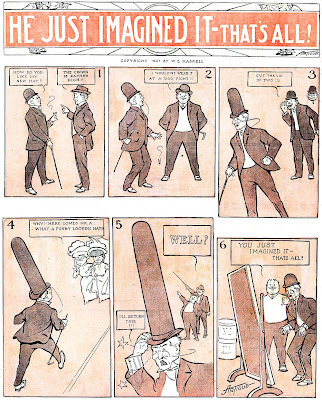 Among those who draw for the syndicates is Quin Hall, whose editorial page cartoon, drawn for King Features, appears in nearly 100 of the smaller American dailies. Partisan political cartoons are out of his field, and he explained the job of drawing syndicate cartoons in this manner. "Human interest is the big factor in editorial cartoons that must appear in a number of papers. Partisan opinions can't be expressed. Cartoons of general interest on political subjects can be used of course, but you can't take sides. It's a lot like the case of the girl whose mother permitted her to go swimming but told her to hang her clothes on a hickory limb and don't go near the water." Mr. Hall believes in injecting humor into cartoons whenever it is possible to do so. He will use a political situation for a cartoon, if it is possible to make it amusing and create a laugh for the person who sees it. On the question of partisan cartoons in partisan papers, Mr. Hall agrees with those who say that the cartoon does more to influence a voter in favor of his own party than it does to turn voters to the opposing party. He also thinks that the animal symbols are very valuable. "These symbols," he said, "have been built up through generations and even the youngsters are acquainted with them. They are a godsend to cartoonists. The Republican and Democratic parties will always be identified with the elephant and donkey in cartoons. They can't break away from it." Mr. Hall has been with the King Feature Syndicate three years. Prior to that he was with the Chicago Daily News, Oklahoma City Times and Kansas City Post. The word 'easy' here in Easy Edgar is used in the sense of vulnerability, as in an easy target. Poor little Edgar, dressed by his mama in what for all the world looks to be a tutu, is trying to impress (no mean feat when you're wearing a tutu) only to have the rug pulled out from under him. This series ran for only five episodes in the Philadelphia North American between November 23 1902 and May 3 1903. Jean Mohr, the cartoonist, used her space for her Sallie Slick strip much more often. Still no definitve word on whether Jean Mohr was a man or a woman. Eugene Noble Mohr was born on April 30, 1877 in Lycoming County, Pennsylvania, according to his World War I draft card. He was the only child of William and Emma. Mohr's middle name was his mother's maiden name. Mohr resided in Philadelphia when the 1900 census was recorded. He worked as an artist for a newspaper. His parents lived in Muncy, Pennsylvania. The Gazette and Bulletin (Williamsport, Pennsylvania) published this item on October 8, 1902: "Jean Mohr, of Avon-by-the Sea, N. J., is visiting his mother, Mrs. Emma Mohr, on North Main street." In the 1910 census, Mohr's mother, a widow, was still in Muncy. The Gazette and Bulletin published this brief item on January 5, 1911: "Jean Mohr has gone to Philadelphia, where he will spend the winter." When Mohr registered for the draft in 1918, he was living with his mother. On the draft card hIs occupation was "newspaper artist, various employers". In the 1920 census they lived on North Main Street in Muncy. His occupation was "artist, at home". "Jean Mohr" was the name recorded in the 1930 census. His mother was 72 years old. Mohr gave his occupation as "illustrator" in the "magazine" industry. The Lycoming County Genealogy Project recorded some of the names at the Muncy Cemetery. Mohr and his mother were buried there; he died in 1961. The Muncy Historical Society has tours of historic homes and gardens. Below is an excerpt from the "Muncy Historical Society & Museum" building tour in 2005.
his work in pencil, charcoal, watercolor, and oil. Leave it to our friend Alex Jay to solve a long-standing puzzle as this one! Good work!----C.J. The Gazette and Bulletin (Williamsport, Pennsylvania) published numerous items about Mohr's employment. Dec. 5, page 2: Eugene Mohr, who is in the Art department of the Philadelphia Inquirer, was the guest of his parents, Mr. and Mrs. W. E. Mohr, the past few days. Nov. 15, page 8: Jean M. [sic] Mohr, the well known cartoonist, one of the art staff of a New York daily, has decided to make Muncy his permanent home. Mr. Mohr will continue to sketch for the New York papers, and will also manage the insurance business of his late father, W. E. Mohr. Feb. 8, page 3: A number of excellent illustrations in the current issue of Good Housekeeping were drawn by Jean Mahr [sic] whose home is at this place [Muncy]. Thanks for all that great info Alex. Sounds like Gene/Jean Mohr was a bit of a momma's boy. I guess Trina's going to have to expunge Mohr from future editions of her women cartoonists books. Would a reader in 1902 have had the same reaction I did to the first panel -- along the lines of "Which of these two characters, both with long hair and wearing dresses, is supposed to be the boy?" Or would Edgar's appearance have been perceived as recognizably male by the standards of that era? Good question, Anon. Edgar's 'skirt' was certainly not standard issue to boys beyond the baby stage. The telltale sign is the hair. Fashionable little girls wore their hair long, in limp curls, whereas Edgar has a boy's bowl cut. No self-respecting little (upper class) girl would have had that haircut. As for the skirt, well, from Alex's bio I would say that Jean might just have liked the idea of boys wearing girly clothes, if you catch my drift.